Philip Paine is the current Musical Director of the Hahndorf Town Band. During 1984 to 1988 he studied and completed his Bachelor of Music at the Tasmanian Conservatorium of Music. From 1988 to 1992 he played for the Australian Opera and Ballet Orchestra. In the years between 1994 and 1997 he completed his Master of Music degree at Adelaide University. Since this period Philip has played in various orchestras including the Tasmania Symphony Orchestra, Queensland Symphony Orchestra, and Principal with the Melbourne Symphony Orchestra. Growing up, Philip participated in Glenorchy City Concert Brass both as a junior and senior player, and as conductor with the band, took them to a B Grade Championship in Tasmania in 1988. He also toured with the band to New Zealand when they won the New Zealand B Grade Championship. 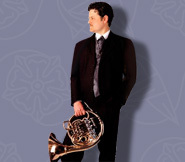 Currently Horn Tutor at Adelaide University and playing principal French Horn with the Adelaide Symphony Orchestra, Philip brings a wealth of professional brass playing experience to the band, and a passion for providing a learning opportunity to the youth in our community.